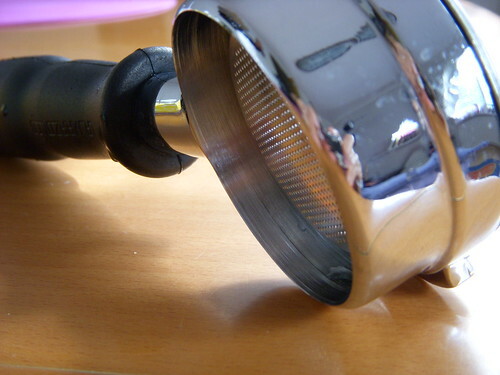 I just can’t go out like this and I’m ashamed to say that it is almost the last day of 2008 – my first full calendar year of blogging – and I have not posted a blog on my number one discovery of the year, the Naked or Bottomless Portafilter holder, You what ? You may say, but take a look below and don’t be shy to ask, if you are a novice of course, what is this ? OK ! I’m going to make this quick and as exciting as possible because although this looks straight forward, it can be quite complicated explaining what this tool of tools is. Luckily for you, I’ve ploughed through a few articles, blogs and discussions to try and summarize what this little invention is all about. Traditionally, you have the normal portafilter holder, with two spouts (for making 2 espressos at once) or one spout (for making one espresso at a time). Anyway one day, someone wanted to know, what goes on if there are no spouts and you can see right through, hence the terminology, “naked” or if you go with the more simplistic terminology, bottomless. In this way, you can see how the coffee begins to come out through the little spore holes in the filter and approximately how many seconds the coffee beings to emerge at what bar/pressure level to make the exact quantity – Are you still with me ? I hope so, because I cannot make it more simple than that. 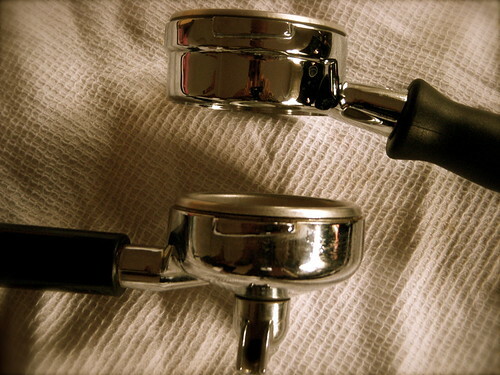 In any case, the next step was to cut off the spouts, so that you have two types of portafilters like below. The traditional one is below and the bottomless one is above. You will be glad to know that to make your portafilter “naked” or bottomless, you don’t have to get your chainsaw out or find a local mechanic who will really think you are crazy but who will nevertheless take your money – you can order one form the best, La Marzocco, of course. OK ! it might not be that cheap, mine cost about 60 Euros ($75 now), but it will be cheaper in the States and you can get one for about $60, made by another company like Rancillo. From an academic view point, if we want to scare you off even more and bring in words that remind you of school, like the word “academic”, the bottomless filter is a good training tool. For example, if you can see what is happening from a “naked/exposed” view point, you can correct your mistake and improve your espresso shots. I can’t get away with this, but I’m going to have to go into “Lesson” mode for this tool, so that you really appreciate what I’m trying to share with you, so here goes. 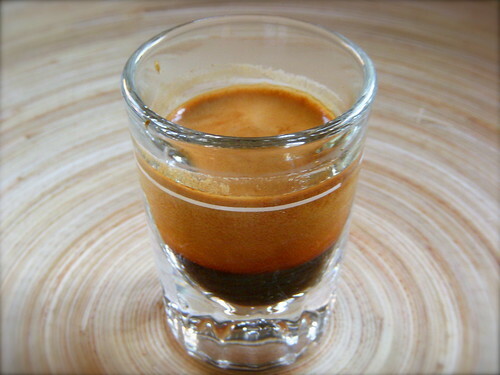 Assumptions:You are an espresso freak and you know the essentials about making an espresso using a really good grinder and good heavy brass espresso machine (upwards of $500). So you know that you buy relatively fresh beans, grind and then tamp them with 30 pounds of pressure, so that the 30 ml of crema top espresso coffee comes out in about 23-27 seconds. OK ! so you are a coffee geek or coffee snub, that’s settled. Lesson 1: If you don’t tamp properly or use too little coffee, assuming you are using the correct grind, then some of the coffee will be under less pressure and your espresso cup will fill up more quickly, violating the 23-27 second pour rule for approximately 30ml of coffee. In short, if using the naked portafilter, you will see a blondish type cone pouring into your cup, which will be flowing with bad tasting coffee. Furthermore, the coffee will be spitting from the outside all over the cup and your coffee machine, making a right mess. It’s like the coffee is saying, if you can’t handle me right, then I’m going to spit on you. In any case, the spitting occurs, because the coffee has not been tamped well or is too little in a particluar area of the portafilter and hence the pressure pushes it out with a lot of force. I don’t have a picture of this for you, but trust me, it has happended to me, when I used less than the recommended 14-15 grammes of freshly ground coffee for a double espresso – I was in a rush to get the kids to school. Also, in this spitting scenario, if you attempt to take a picture, you might get coffee all over your lenses. Lesson 2: If you tamp properly but the grind is too fine, your coffee will take ages to come out and will taste sour/burnt. 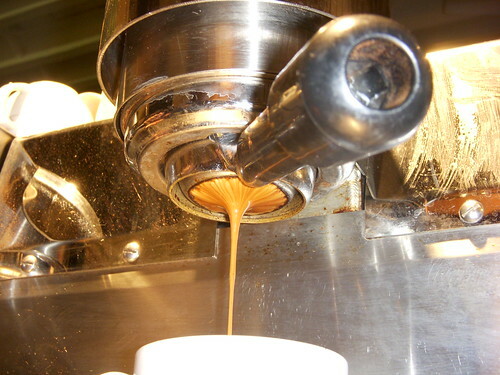 In this case, using the naked portafilter, you will see that when you get to 18 seconds, drops of honey like espresso begin to pour out – it may look good, but it isn’t going to taste good, trust me and of course you are not going to get 30ml of espresso coffee into your cup between 23-27 seconds, but much less. Again this has happened to me when I got a new bag of coffee and wanted to test for the right grind. Seeing this scenario, I quickly loosened the settings on the grinder to avoid wasting anymore precious coffee. Now, doesn’t that look lovely ? You can see a few colours here. The darker ones have a higher concentrate of well extracted coffee and you will notice that the coffee seems to be flowing right, without any gushing. If you are feeling brave, hold a single shot espresso cup carefully over the naked portafilter, making sure you watch the extraction closely so that you don’t burn your hand with free flowing 93C degree coffee and you can also make a ristretto, with should display excellent crema as evident by the dark brown bits, which dominated this cup of ristretto (i.e half a cup of espresso). Conclusion/Analysis: Using the naked portafilter helps you to (i) estimate very quickly if you have the right grind (ii) improve your tamping technique, especially in making it more even (iii) know very quickly if you used to much coffee or too fine a grind (thick honey drops) and (iv) look good, if you invite your friends to show them a perfect extraction, but practice beforehand. What Else ?According to some experts, because the extracted coffee comes into less contact with metal, because it basically flows from the portafilter into your cup, you should get a more “purer” taste of coffee. If you notice, there will be very tiny bubbles in your cup. In any case, I usually use mine when I get a new bag of coffee from a different roaster or a different type of coffee. 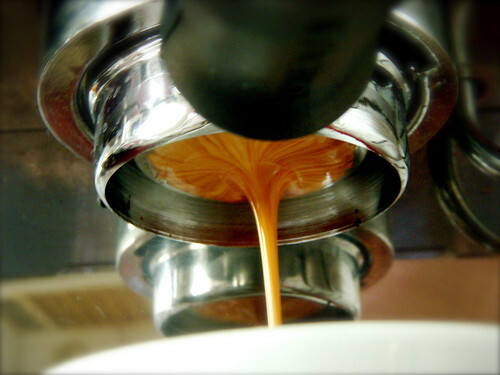 When I got my naked portafilter, I used it for several weeks, because I just liked the way it flowed into the cup. Serious coffee shops like Origins Coffee Roastingin Cape Town have naked portafilters, like the one below, extracted on their Synesso Cyncra machine. Also, my favourite coffee shop in London, Flat White have them, as evident by my request for a triple espresso, using a naked filter (see my post of 25 March 2008), but you will have to make a request for it. My advice, go on experiment and enjoy, HAPPY NEW YEAR !